In the 1930's and 1940's, Dr. Wilhelm Reich was able to detect and measure the existence of etheric energy (life energy, chi, etc. ), which he called orgone, using a modified geiger counter. Dr. Reich determined that stacking alternating layers of fiberglass (an organicsubstance) and steel wool (an inorganic substance) would aually attract and collectorgone/etheric energy of both the life-beneficial positive form (which Reich called "OR" or "POR") and harmful negative etheric energy ("deadly orgone" or "DOR"). He constructed large boxes called orgone accumulators or "oracs" using this simple layering principle and was able to successfully heal his patients of various ailments, including various forms of cancer, by having them sit inside the box for periods of time. In 1986, scientists at the University of Marburg, Germany published the results of a blind study1which showed that 30-minute orgone accumulator treatments caused consistent, positive psycho-physiological effects not seen with the all-fiberglass box used for a control, stating "the results received in our investigation furnish evidence for the assumption that the physical properties of the orgone accumulator and its psychophysiological efficacy on human organisms, postulated by Reich and his associates, factually exist." Reich's work was continued in earnest in the 1960's by more open-minded Russian scientists such as Dr. Nikolai Kozyrev (1908-1983), who also scientifically proved that such unseen energies indeed exist all around us, and who's Reich-inspired work led to the unfortunate development of practical Soviet military defense applications which utilized principles of so-called "torsion fields" (e.g., etheric energy). Kozyrev's work, which indeed confirms both Reich's research and our empirical experiences with orgonite, was classified until the fall of the Soviet Union in 1991. Following in their footsteps, thousands of Ph.D.-level researchers from both sides of the Iron Curtain spanning multiple generations have continued Kozyrev and Reich's pioneering work, slowly forcing mainstream Western science to finally, "officially recognize" the concept of a universal, unseen energy medium they call "dark matter," "vacuum flux" or "zero-point energy," depending on who you ask. 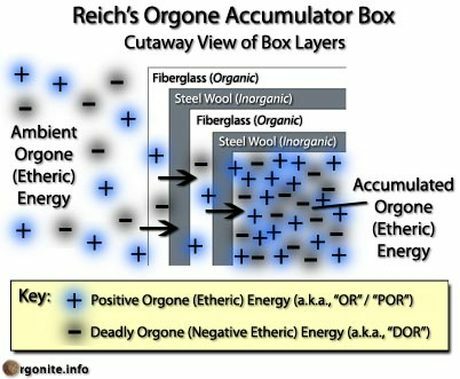 It is commonly understood among orgonite enthusiasts that these are all essentially describing the same thing, which Reich called "orgone". The Advancements of Orgonite Reich built his research lab, dubbed Orgonon, in rural Maine, USA, as this location was at the time very isolated from sources of "deadly orgone," which his accumulators would collect indiscriminantly. Operating an orgone accumulator near sources of DOR (such as nuclear power plants, radio towers, etc.) has the potential of harming anyone receiving treatment inside it, so geographical location was and is an important factor for orgone accumulator operation. In 2000, a couple named Don and Carol Croft discovered through some Internet research and empirical observation that mixing catalyzed organic fiberglass resin with inorganic metal shavings, poured into small molds such as paper cups and muffin pans, would produce a substance which would attract etheric energy similarly to Reich's accumulators. Thus orgonite represents a very significant improvement over Reich's early work with orgone accumulators, since Reich's "oracs" attract deadly orgone energy as well as positive and do nothing to transmute it into a purely beneficial form, which orgonite does inherently and continuously. Within a year of this development, Don began publishing reports of his and his wife's experiences in, among other things, the tactical deployment of small pieces of orgonite near any and all sources of DOR, or life-negative energy, such as cellphone towers, nuclear power plants, underground bases and natural Earth energy gridlines and vorticies. Don included in his reports the specific life-positive, cleansing, healing,confirming effects they would notice following such "gifting" activities, causing Don to strongly encourage his readers to replicate his efforts in their own communities.